"By the divine grace which dwelt in him, [St. Spyridon] wrought such great wonders that he received the surname 'Wonderworker." So it is that, having tended his flock piously and in a manner pleasing to God, he reposed in the Lord about the year 350, leaving to his country his sacred relics as a consolation and source of healing for the faithful. About the middle of the seventh century, because of the incursions made by the barbarians at that time, his sacred relics were taken to Constantinople, where they remained, being honoured by the emperors themselves. But before the fall of Constantinople, which took place on May 29, 1453, a certain priest named George Kalokhairetes, the parish priest of the church where the Saint's sacred relics, as well as those of Saint Theodora the Empress, were kept, took them away on account of the impending peril. Travelling by way of Serbia, he came as far as Arta in Epirus, a region in Western Greece opposite to the isle of Corfu. From there, while the misfortunes of the Christian people were increasing with every day, he passed over to Corfu about the year 1460. 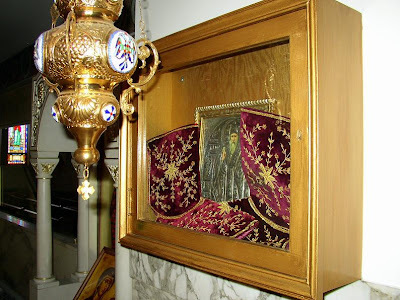 The relics of Saint Theodora were given to the people of Corfu; but those of Saint Spyridon remain to this day, according to the rights of inheritance, the most precious treasure of the priest's own descendants, and they continue to be a staff for the faithful in Orthodoxy, and a supernatural wonder for those that behold him; for even after the passage of 1,500 years, they have remained incorrupt, and even the flexibility of his flesh has been preserved. Truly wondrous is God in His Saints! (Ps. 67:3 5)"
St. Spyridon, as was mentioned, is beloved throughout the whole world, however, the people of the island of Kerkyra are especially devoted to him. Four times a year, I believe, they have a procession of his holy and incorrupt Relics, in commemoration of the numerous miracles of his to save the island. The following info on those feasts is taken from: http://www.corfunext.com/saint_spyridon.htm. 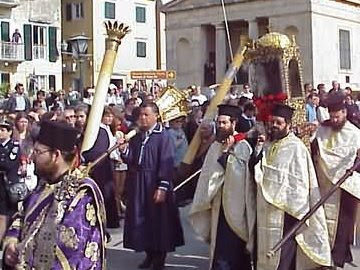 The Easter Saturday procession commemorates the relief of the island from famine, and is the oldest of the four processions and the most solemn, since it is combined with the Orthodox ritual carrying the ‘Epitaph’, a gilt bier representing the body of Jesus Christ being borne to the grave. On this occasion the canopy is not held over the Saint but over the Epitaph. This custom dates back to 1574, when the Venetian Senate prohibited the Greek Orthodox processions of the Epitaph taking place on Good Friday. Local custom and tradition has for this reason moved the Epitaph procession from Good Friday to Easter Saturday exclusively for the Church of St. Spyridon. 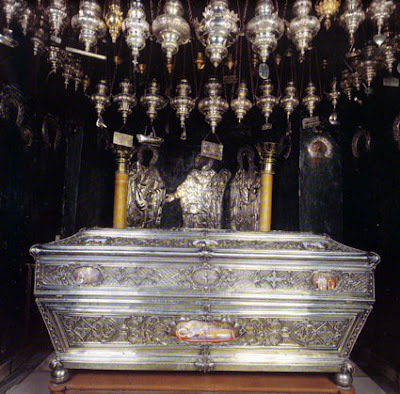 The Saint’s body is not replaced in its permanent silver casket when the procession is over, but is exposed day and night for general [veneration] by the faithful until the afternoon of Easter Tuesday. The story of this procession reaches back to the middle of the sixteenth century. According to the legend of the Saint, the inhabitants of Corfu were suffering from famine since no grain ships could sail owing contrary winds. Unexpectedly, on Easter Saturday, ships loaded with flour sailed into Corfu harbor. They were sailing past the island and had been diverted thither by St. Spyridon who appeared in a dream to the captains and induced them to change their course and sail at once to Corfu because the population was starving. The flour was unloaded and distributed to the inhabitants who thus satisfied their hunger and celebrated Easter joyfully. According to historical evidence Easter Saturday procession was probably first held in the second half of the sixteenth century. 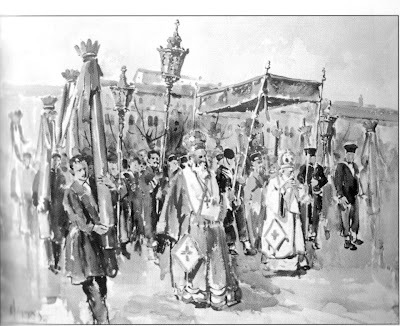 The third procession of St. Spyridon is held on 11th of August, in remembrance of the Saint’s deliverance of the island from the Turkish siege of 1716. The legend of the Saint mentions that there appeared to the enemy Saint Spyridon surrounded by a glorious heavenly host, holding in his right hand flashing sword, and furiously pursuing them. On its return to the church the Saint’s body is exposed for general [veneration] for three days and two nights. See the following links for more information on the great miracles of St. Spyridon in driving back the Turks from the island of Corfu, and defending his church from the Latins. The last in the calendar of the processions of St. Spyridon is that on the first Sunday in November in commemoration of the miraculous intercession of the Saint in saving Corfu from deadly plague, which twice visited the island in the seventeenth century. The history of the procession goes back to 1673. The pestilence was first identified in one of the suburbs and soon spread all over the town; the entire population was gripped by terror of death. For three nights a light was seen by the local inhabitants on the bell-tower of his Church and the figure of Saint Spyridon, carrying cross in one hand, appeared driving the pestilence away. 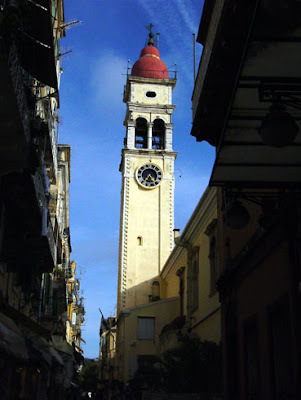 The Venetian Governor, at request of the people of Corfu, sanctioned by decree on the 29th of October 1673 that the procession be held every year on the first Sunday in November.Bibliography: STAMATOPOULOS, N.: Old Corfu, History and Culture"
Some of the faithful refer to St. Spyridon as "The Walking Saint", because his slippers must be replaced every year because they are worn out from his various miraculous travels to heal and help people (http://orthodoxwiki.org/Spyridon_of_Trimythous). May St. Spyridon intercede for all of us and help us! I am a doctor from Romania. My 1 year and 4 months old boy was born with right tear duct obstruction. It usually heals by itself by the age of 1. Since it was not our case, we prepared ourselves for surgery. A couple of days before surgery, I touched his eye with a piece of Saint Spyridon' s silk shoe and prayed. It's been 5 days now since the tears and eye secretions are gone. We went to the ophtalmologyst and she confirmed it: he is healed! Rejoyce, Saint Spyridon, great wonderworker!